Diabetes is a serious health condition that can lead to heart disease, stroke, kidney failure, high blood pressure, and blindness. Prediabetes is a potentially reversible condition that often leads to type 2 diabetes, and 79 million people in the United States are estimated to have it. If you have been diagnosed with prediabetes, or believe you may be at risk for developing the disease, the YMCA’s Diabetes Prevention Program can help you develop a healthier lifestyle and work with you to reduce the risks this condition can pose to your health. Based on effective efforts researched by the National Institutes of Health, the YMCA’s Diabetes Prevention Program will help you learn about and adopt the healthy eating and physical activity habits that have been proven to reduce the risk of developing type 2 diabetes by 50-71%. Through the program you will receive support and encouragement from both a trained lifestyle coach and fellow classmates as you develop a plan for improving and maintaining your overall well-being. Download the Intake Form and email to DPP@crmetroymca.org or bring it in to the YMCA at Mercy Health Plaza. 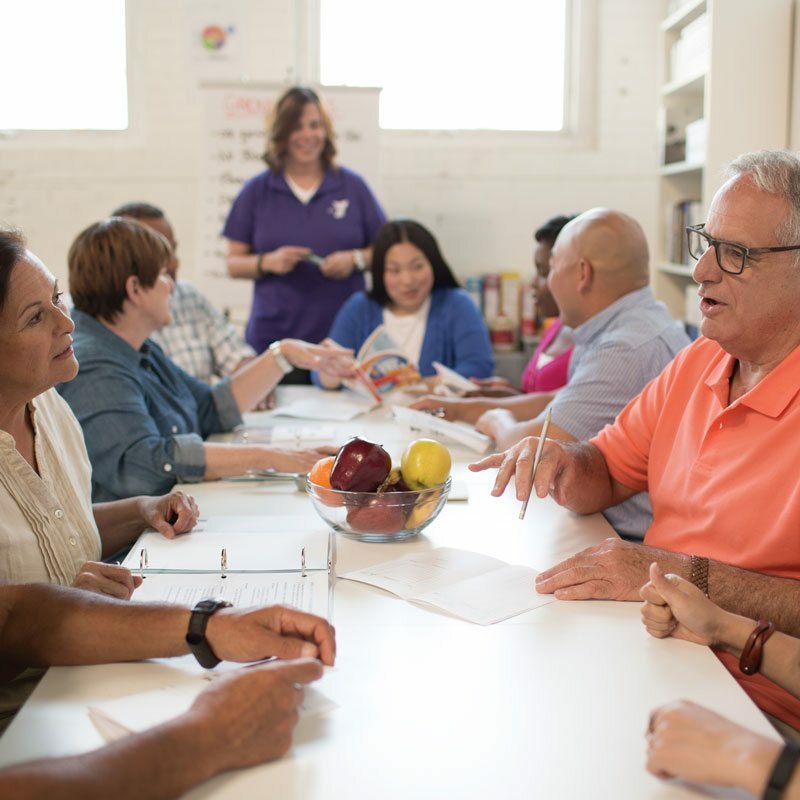 The 12-month group-based program consists of 16 one-hour, weekly sessions, followed by monthly sessions led by a trained lifestyle coach who facilitates a small group of people with similar goals. Discuss topics such as healthy eating, increasing physical activity, reducing stress, problem solving, and much more. Eating smaller portions, reducing fat in your diet and discovering healthier food options has been proven to help prevent the onset of type 2 diabetes1. Studies have repeatedly shown that moderate physical activity (walking, swimming, mowing the lawn) for as little as 30 minutes, five days a week can help improve your blood pressure, raise your good cholesterol and prevent blood flow problems2. It has been shown that reducing your body weight by even a small amount (as little as 7%) can offer tremendous benefits for people at risk for diabetes3. $429; includes 25 classes AND one year individual complimentary YMCA pass (as long as you are active in the Y’s Diabetes Prevention Program). There is financial assistance for anyone who cannot afford the full price. A free informational session is provided before the start of every session. Classes start when we receive a minimum of 8 participants. Add your name to the waiting list at any time to be contacted when the next class begins. An estimated one in three U.S. adults has prediabetes, yet just 11% of those with prediabetes know they have it. Take the quiz by clicking the link provided to learn if you are at risk for prediabetes and type 2 diabetes. Based on research funded by the National Institutes of Health, Indiana University and the CDC, the program has been shown to reduce the number of new cases of type 2 diabetes by as much as 58%. The reduction was even greater, 71%, among adults aged 60 years or older. Prediabetes is a condition in which individuals have blood glucose levels that are higher than normal, but not high enough to be classified as diabetes. People with prediabetes are at high risk of developing type 2 diabetes, heart disease and stroke.